The living area of the chalet is 119 square meters and it stands on a 200 sq meter plot. One of the double bedrooms has an en-suite bathroom. There is a second bathroom. Both bathrooms have shower enclosures. The second bedroom is actually slightly bigger than the first. Both bedrooms could be arranged either as a double bedroom or as a twin bedroom. There is certainly adequate sofa space to sleep two more people downstairs. There is a downstairs toilet with washbasin. #Bargain price - Comfortable accommodation for up to 5 persons.. We are featuring Chalet 25. This ski chalet has a traditional open plan living room with dining area, and cosy romantic home warming wood burning fire but has also got central heating. There are 2 sofas, a dining table and seating for 5.. There is cable television and DVD player/family selection of DVDs Playstation/games and wireless I-Net (wireless internet). There is a fully equipped kitchen. The onsite restaurant and bar is just across the quiet road. We are also close to the sauna area. Up the traditional wooden staircase, there are 2 shower rooms with WCs (1 is en suite). There are fitted wardrobes; each bedroom has its own balcony. There is a covered patio. you can sit and watch the beautiful sun-sets. The ski chalet is ideal for either families or groups. This is an area of outstanding natural beauty. Larger groups can be accommodated by renting neighbouring chalets as well. #Late Deals from mid January - bargain ski holiday! PAMPOROVO VILLAS is a secure community. There is a little drive to the hamlet - space for snowball play and ideal for children. A children's play area and Kindergarten are being completed. Try a Multi Activity Holiday to the beautiful Rhodopi Mountain area (including Pamporovo Ski Resort) for sunshine and relaxation as well as an extensive array of adrenaline and leisure sports activities. Our Activities Centre provides adventurous activities to suit all levels, and will appeal to friends and family, as well as couples and solos. We can also provide excursions for you to admire the magnificent scenery and for the cuture vultures. In other words, a holiday to suit all ages and to suit the passive to the adrenaline junkies. Whether you feel like trying whitewater rafting or quad biking, cycling, horse riding, mountain hiking or abseiling, paintballing or jeep safaris there is a wide range of activities to suit all. Getting close to nature and taking advantage of the scenery by horseback or jumping on a sledge pulled by huskies is the perfect opportunity to see the amazing scenery Bulgaria has to offer. There is also a water park at Plovdiv. In other words, this is a holiday to suit all ages and to suit the passive to the adrenaline junkies. We are not far from the Greek Aegean coast.There is a new road through the mountains (via Zlatograd) to Xanthi which will reduce the journey time to just 90 minutes. You can reach Chalkidiki in 3 hours. You could rent a place there for a few days. We recommend www.psl-bg for both car hire and cross border airport transfers. 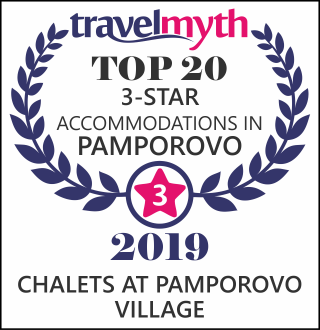 Chalets at Pamporovo Village has been voted by Venere.com's users as Top Overall Ratings 2013. This award is exclusively determined by Venere users' feedback and only 5000 properties out of 135.000 across the world are receiving it right now. Ski chalet is FOR SALE by owner. Contact the owner via this website. The sale will not affect further rental bookings. Pamporovo is for the future (as well as today): There are plans to link Pamprovo with Mechi Chai, the nearby ski resort at Chepelare. For those wanting to ski on longer red runs this will be a great bonus. Advanced skiiers and snowboarders can already ski/snowboard to Chepelare (wtih a guide/instructor). It is a short drive away. Combining Pamporovo and Chepelare will create the largest ski resort in the Balkans with over 80 km of tracks. Всичко беше прекрасно! Природата беше красива, хората бяжа приятни и вилата беше чиста и удобна. Ние го препоръчвам на всеки.